Drywood termites are found from NC along the southern boarder of the USA and the coast of California northward to the San Francisco Bay area. They start their colonies in pre-existing openings in wood with low moisture level. Due to the fact that they live entirely in wood pieces, diy Timbor for drywood termites can help the most homeowners in the USA and Australia wipe out these destructive pests. In fact, diy Timbor for drywood termites was specially designed for preventive treatment. This borate product penetrates only 1/4 inches deep into wood, which is not sufficient for their elimination. In order to get rid of drywoods, it is better to apply more concentrated glycol-based borax derivatives, such as Bora Care, Shell Guard or Jecta gel. They penetrate the wood structure deeper and saturate it about 4 inches from any side. Borates with glycol are ideal for eliminating active drywood termite infestations. Pest control professionals can treat all available wood wherever termite activity is observed. Walls and voids can be drilled and injected with high pressure mist, gel or foam of boric acid. Crawl spaces and any other zones with infested wood are also treated with glycol boric acid products. Timbor is a professional product. It can be purchased by pest control professionals with license. Though, the homeowners often buy Timbor termicide on ebay and amazon to perform treatment on their own. This treatment helps them save a great deal of money, though this process is not so easy as it may seem at first. In order to apply diy Timbor for drywood termites, you must read the product label 1 carefully and follow it as directed. Do not forget about your personal protective equipment (for Category C) to prevent from skin or eye irritation, accidental inhalation or swallowing the chemical product. 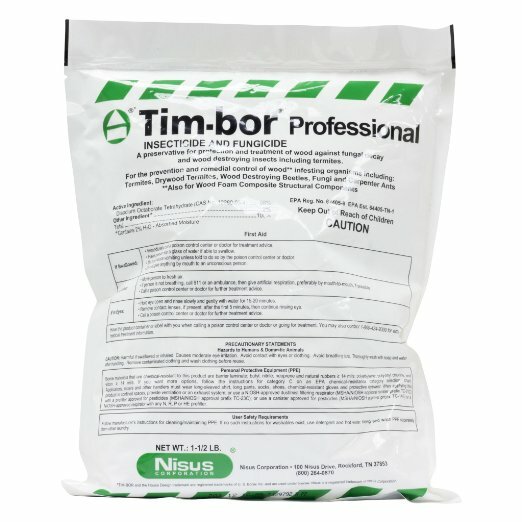 Timbor is sold in powder formulation, which should be diluted with water for mixing liquid solution or foam. For drywood termites, it is recommended the homeowners to apply 10% Timbor finished liquid to bare wood and structures, including fences, decks, barns, walls and others. When you mix it, use water in a 1:1 ratio for the best results. It means, 1 pound of Timbor powder must be dissolved in 1 gallon of water. For remedial control and protection against drywood termites, two applications of 10% Tim-bor solution are required. Take a paint brush and coat or brush the liquid borate on the wood surface. Dry wood absorbs DOT liquid easily, though it has a drawback: borate leaves a whitish residue on the surface after it dries. This coating will break down in just a few years and will prevent your home from termite attacks and any future damage. It is necessary to protect the treated structure from excess rain and moisture. You can also drill holes in the walls and wood structure in 4 ” pattern at a downward angle. Inject 10% Timbor liquid under pressure into the drill holes, openings and cracks in wood, until run-off is observed coming from exit holes. Diy Timbor for drywood termites treatment can also include application of Timbor powder. 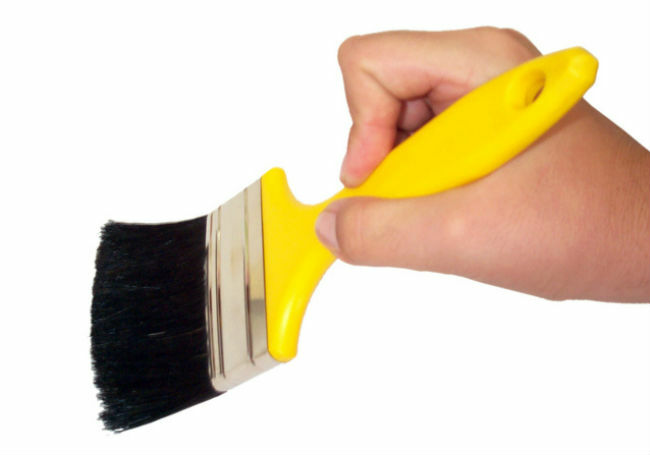 Dust can be injected into galleries and voids at application rate of 1 oz per 2 sq. ft. Note that penetrating properties of powder are limited and its coverage area is reduced. Too much dust can seal or plug the termite galleries, and drywood nymphs that act as workers and soldiers, just isolate these areas and won’t use them for their purposes. Tim-bor powder can be also applied for coating the wood surfaces for preservation. Well one ob is 454 grams….and a gallon is approximately 4000 grams…hardly a one to one ratio. !